Michelle's Handcrafting Blog: I won a Valentine's Day giveaway competition! I won a Valentine's Day giveaway competition! On Monday 11th February, I was the lucky winner of the Valentines Day giveaway competion, organised on Twitter by the lovely Jan of Stems Floral Design.. To participate, all you had to do was follow and retweet, the tweet that Jan had sent out. I was already following Stems Floral Design and retweeting was something I always did for Jan and vice versa. I woke up the next day, to a message from Jan to say I'd won the competition, yay!!!!! 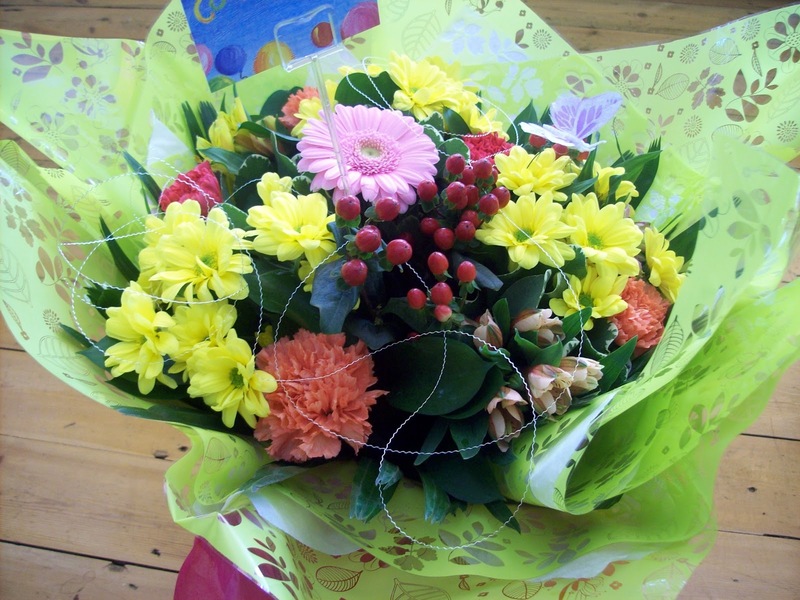 The flowers were delivered on Wednesday morning and all I could say when I got them was wow, they were just gorgeous. I love receiving flowers, but these I have to say were one of the best floral arrangements I'd ever seen. So next time your on Twitter and you come across a tweet from Stems Floral Design, telling you there is a giveaway competion, you'd be silly not to enter, you might be lucky enough to receive a floral arrangement just like the one I won.